TOKYO: Yokogawa Electric Corporation has introduced an on-demand hydrate risk management solution that helps offshore oil platform operators to maintain production levels, protect plant assets, and minimise operating expenses and downtime by optimising pipeline chemical injection. The new solution integrates simulation software from KBC, a wholly owned subsidiary, with Yokogawa’s flexible supervisory control & data acquisition (SCADA) software to deliver a dashboard that enables consolidated, on-demand monitoring. Automated chemical injection metering valve technology can also be integrated as required. During the plant design phase of oil and gas offshore platforms, modelling and simulation software and pre-operation field test data is utilised to optimise the pipeline network design and calculate the amount of inhibitor required to prevent hydrate formation. During operations too, field operators use the simulation results to calculate the amount of inhibitor to be injected into the flow. Injection rates are regularly reviewed by field experts, but without real-time visibility into the actual state of the pipeline, operators tend to overdose the inhibitor to provide a sufficient buffer for daily operational conditions and to compensate for changes in field properties over time. This can result in excessive chemical use and increased operating expenses. 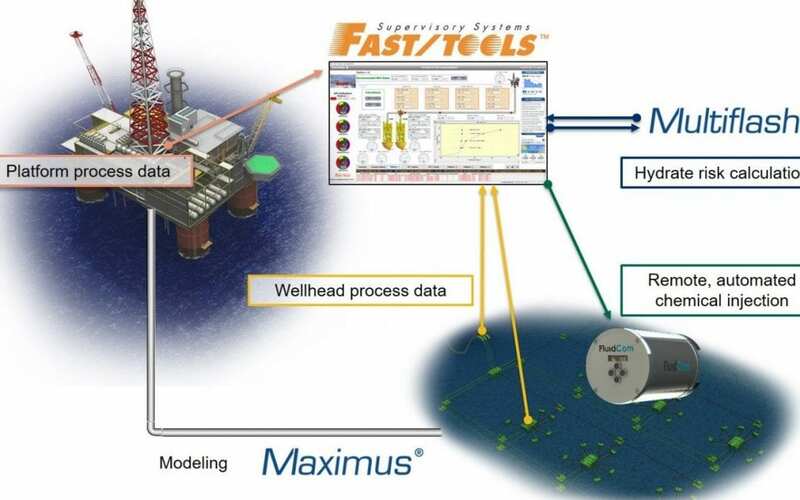 With the aim of enabling more efficient hydrate risk management, Yokogawa has developed a common dashboard for KBC’s two advanced, complementary simulation software solutions, Maximus and Multiflash, and Yokogawa’s own FAST/TOOLS SCADA system, making on-demand flow assurance a possibility for the first time.